I'm always a little wary when it comes to overly hyper products or brands, I never really know if it's justified or if people are being influenced by others opinions. So when I purchased a few products from the brand to try, I wanted to wait a few weeks to give my verdict. 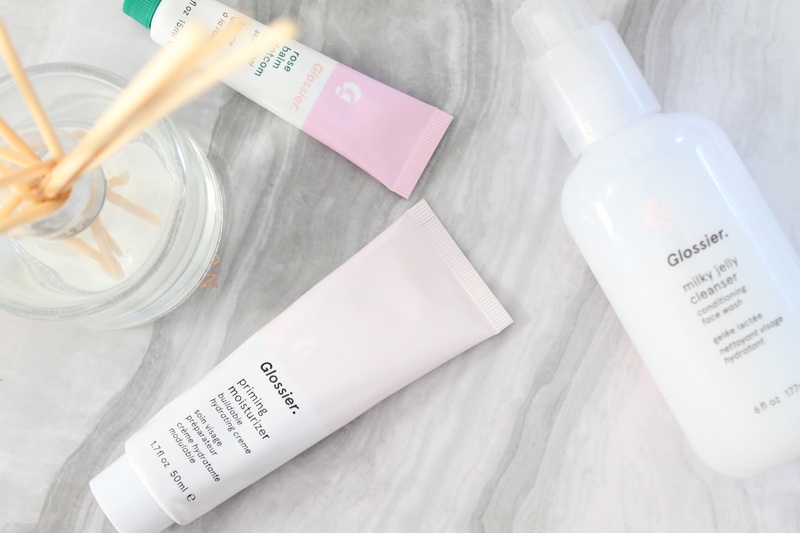 If you're not familiar with the brand, Glossier is "inspired by real life" - its very much focused on creating a natural dewy look through skin care and make up. It's also cruelty free, and all products are vegan friendly. Sounds perfect, and I totally get why that idea has been hyped. But was it worth it? 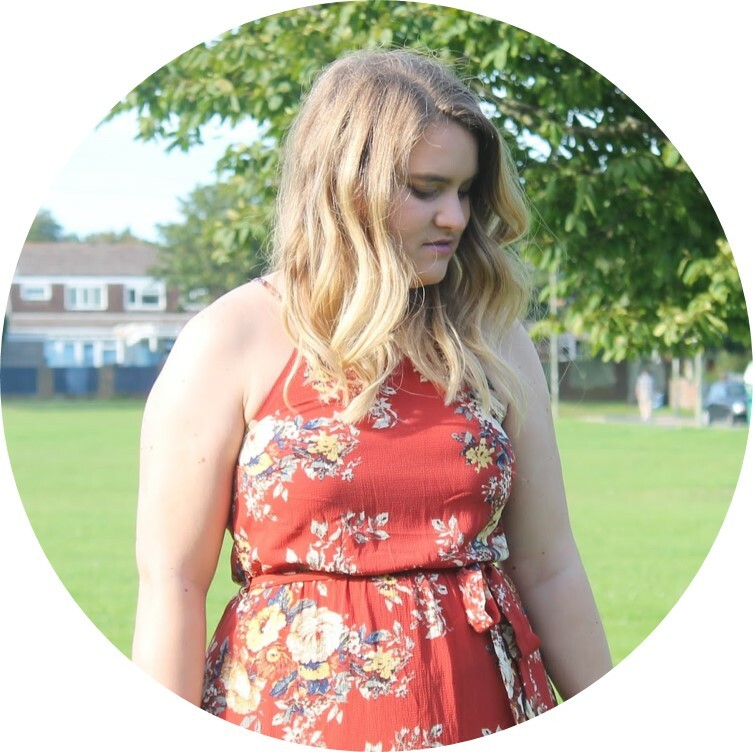 I picked up six products, there isn't a massive range so you don't get overwhelmed - which I love, but I thought I'd start with six and expand as I go. As and when I get some more products I will let you guys know how I get on! I wanted to make sure I got the most for my money, so to try some skin care pieces I picked up the Phase 1 Set, which contained three best selling skincare pieces. The first product you get is the Milky Jelly Cleanser, something I really wanted to try as it's described as a conditioning face wash, and I find a lot of time dry me out slightly unless it's a balm cleanser. It's a weird feeling formula, definitely gelly but very light on the skin. For me I've found it's a great morning cleanser to use in the shower, as it leaves the face feeling very clean, clear and bright. However, it's definitely not one for make up removal, I just found it didn't really make a dent in it in the evenings. So if you're someone who likes one cleanser for both morning and night you may not like it, but if you don't mind having something different it's a nice addition to your skincare. But not vital. The second piece you get is the Priming Moisturiser, and I feel like I've been on a journey with this product. Swings and roundables. How much I like this product on a daily basis depends on what base I wear with it. The primer itself is beautiful, it smooths the skin like nothing else I've used and hydrates at the same time. I also love how my make up looks on top of this - it gives a very flawless finish. Make up glides over it, and it basically gives the perfect base. However - because of my combination skin, I find it works better with higher coverage, matt foundations than dewy ones. For example, when I wear this with my Nars Sheer Glow I look really shiny and oily by the end of the day. Whereas with more matte products it just gives a nice glow under it and everything stays in place. I think if you have oily skin you may not like this, but those with dry skin will love it. Then last but not least in our set, we have Balm DotCom - a very hyped lip and skin balm which is possibly my favourite product from the brand so far. I am super, super fussy when it comes to lip balms, so when I find one I like I become a little obsessed. Now this is technically a universal skin salve, but I've been putting this on my lips every night before bed since I've had it and there's such a difference. My lips feel smooth, and plump, and generally in good condition. I picked up the Rose version as it's supposed to have a pink tint - if it does it's super subtle, but you have the choice fix flavours in total. I would highly recommend this - if you try anything from the brand or skincare section pick this up. They do a set of 3 for £25 so when payday comes around I'm picking up the Birthday Cake version, the Cherry one and the Mint flavour. I think the trio makes a really cute present as well - tip for Christmas! Now let's move onto the three pieces I picked up from the make up section. The idea of their make up is to stay very natural, very dewy and just play on your natural beauty. And I LOVE the idea of this so I'm excited to try out more of their products in the future for my no make up working from home days. One product I picked up was Wowder - a very finely milled finishing powder that is meant to blur the finish of your skin and get rid of any shine. It also has this really cool mesh concept which helps to keep the loose powder nice and tidy in the packaging - which is one of the reasons I tend to avoid loose powder so already this had a plus point. I really like this. It's a very light powder that really does what it says. It gives a very flawless finish to the skin without looking cakey or settling into lines. This would definitely be my second favourite product that I picked up. I've been using it on a daily basis and it's made a nice change from my usual matte setting powders. My most disappointing product was definitely Cloud Paint. I'm not a huge cream blush fan, but I did like the formula of this. It was gel like, applied nicely - didn't feel too wet - and didn't leave an oily or sticky finish to the skin. However, I just found it was quite hard to get any real colour pay out from the product. I picked the shade Puff - which comes out bright Barbie pink and a little scary - but once it's blended it's a little hard to detect. You have to really build it up and by then I've used quite a lot of product and it stops looking natural. It's one of their most hyped products so I was really disappointed with this. And then last but not least we have the Generation G lipstick - because there was no way I was placing an order and not picking up their one lipstick. These are sheer matte lipsticks, that create a definite blotted or tinted look to the lips. I picked up the shade Jam - very autumnal. It's a gorgeous purple berry shade, which looks really scary in bullet form but super pretty on the lips. Because it is a matte and a dark shade it does tend to pick up on any cracks in the lips, but generally it looks really nice. It's a lovely way to add some subtle colour to your make up look if you don't want to go full liquid lipstick pigement. The shade of this really reminds me of Mac's Rebel - but a more muted version. I did really like this, it took a little warming up to begin with, but it's quite a nice lip product. I wouldn't say it's worth the £14 price tag, but it's a nice addition to my lipstick collection and there's definitely more shades that I want to try. There are six shades to choose from, and something I really like is that they show you photos of what every shade looks like with different skin tones - which I think is a really good extra touch. So there you have it! I definitely want to try more of the products to get more of a feel for the brand, I've got my eye on their Stretch Concealer and Skin Tint to see what they're like. I'm also super intrigued by their body care range as well. If I had to recommend products I've tried - definitely try Balm DotCom and Wowder, they're great and daily products for me. The others are nice, but not ones I would say you had to try or rush out to order. In terms of whether or not the brand was worth all the hype? I'm not sure. I think the brand has nice products, but I wouldn't say they were overly special or unique to be honest. I think the concept is great, and executed well from what I've tried. But I don't think the hype was actually necessary... But I may change my mind as I try more from the brand, who knows?